The Albuquerque Biological Park, often referred to as the BioPark, is made up of four separate facilities: an aquarium, botanical garden, Tingley Beach, and the Rio Grande Zoo. A small train system connects the four sections of the BioPark providing a fun and easy way to travel between attractions. Although we had a chance to tour the aquarium, botanical gardens, and zoo, during our Spring Break visit to the BioPark, this review will focus exclusively on the 64-acre zoo. Look for reviews of the other attractions soon! Babies! The Rio Grande Zoo had more babies on display during our Spring Break visit than I think I’ve seen during all other visits to all other zoos combined, including twin chimps, a young giraffe, and baby Asian elephant! 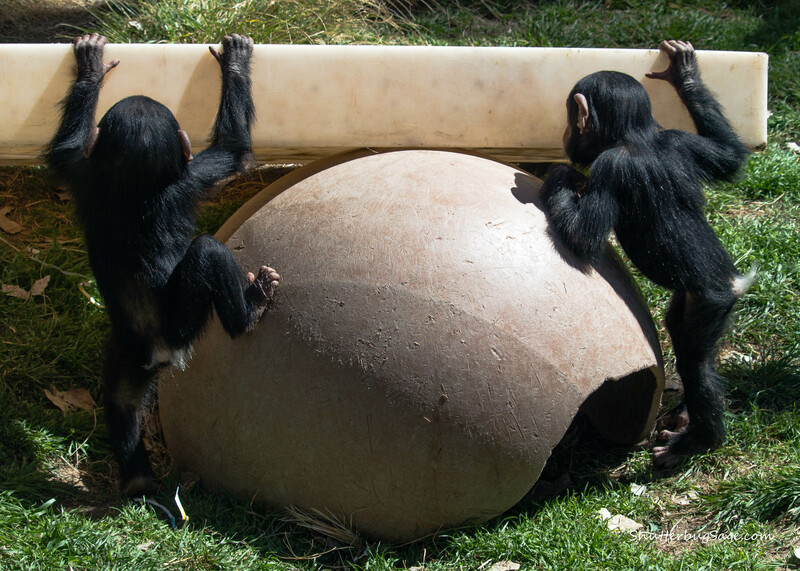 Twin chimp boys, Rio and Dezi, are the first set of twin chimpanzees born at the Rio Grande Zoo. Watching how busy they were and how much they kept their mom, Elaine, on her toes brought back memories of how much energy it took to keep up with my twin toddlers back in the day. At just over a year old, they will continue to nurse from their mom for another three to four years. In what seemed like the chimpanzee version of walking around the house to get a fussy baby to sleep, Elaine hoisted the twins up onto her back and headed out to a shady spot in the far corner of the enclosure for a siesta. 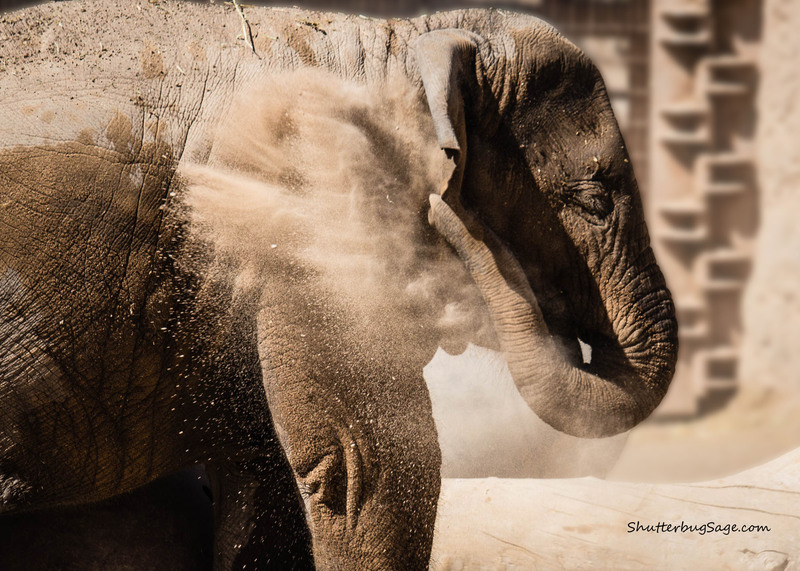 Two-year-old Asian elephant Jazmine kept her cool during a warm spring day by tossing dirt over her back to protect her from both sunburn and mosquitoes. The Albuquerque Zoo is one of the few US-based facilities to successfully breed and raise elephants in captivity. Born in October 2013, Jazmine was the third Asian elephant calf to be born in New Mexico. Born last July, giraffe baby, Kumi, was also on display. Kumi is Swahili for the number ten, and his name comes from being his mother’s tenth calf. He was about six feet tall at birth and was able to run around just a few hours after being born. Polar Bear Twins. 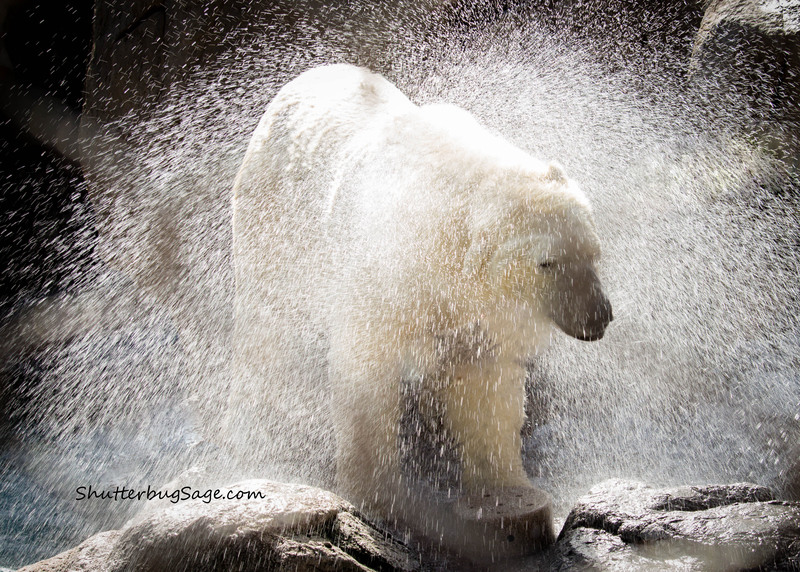 While they’re no longer babies, and are actually older than my soon-to-be adult twins, twin polar bear boys Kiska and Koluk put on quite a show for us during our visit to the Rio Grande Zoo. After retrieving the toy that he tossed into the pool, the polar bear twin shook off like a dog after a bath. Luke the Koala. In anticipation of the two male koalas visiting the Kansas City Zoo this summer, we were so excited to visit one of the ten-ish zoos in the US with a koala on exhibit. Luke the koala was predictably asleep. After all, koalas sleep about 20 hours a day. Check out this adorable video of one of the Rio Grande Zoo keepers interacting with Luke! Tasmanian Devils. Along with the San Diego Zoo, the Rio Grande Zoo is one of a handful of zoos in the US that house the terrifyingly fascinating marsupial from Down Under. The carnivorous critters are currently listed as endangered and wild populations have decreased 80% over the past 20 years due to a highly contagious facial tumor disease. What about you? 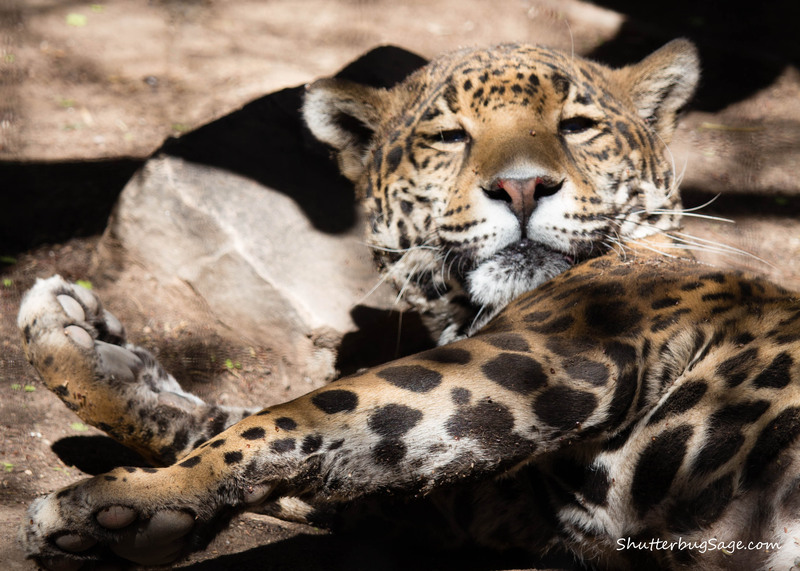 Have you visited the Albuquerque BioPark or Zoo? Share your thoughts in the comments below! 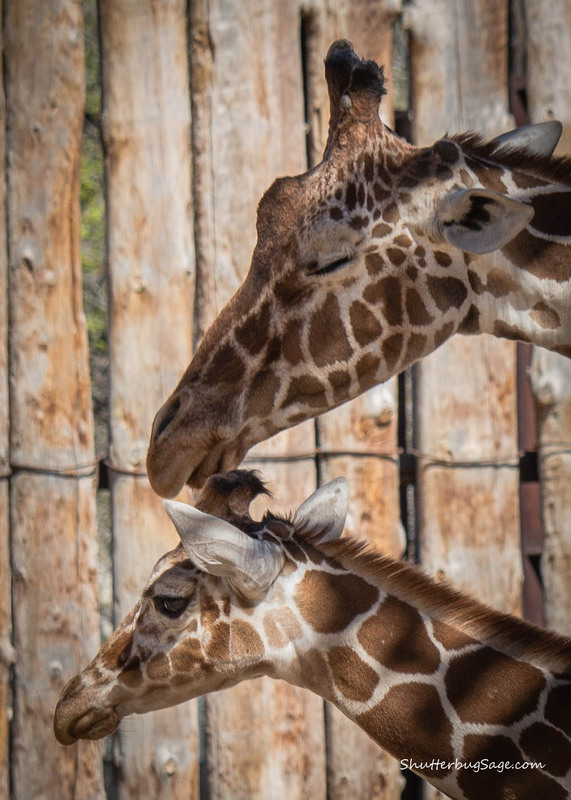 Plan ahead by downloading this map of the Albuquerque BioPark attractions. If you plan on visiting more than one of the four attractions at the Albuquerque BioPark, be sure to consider the combo admission. If you have a zoo membership, like the Kansas City Zoo’s Friends of the Zoo program, be sure to ask about any discounts at the ticket office. We received 50% off our tickets through this program paying only $10/adult and $3/child for combo tickets. Allow about three hours to visit the zoo, two hours to explore the botanical garden, and an hour to tour the aquarium. I would also prioritize the attractions in that order. If you run out of time to visit the aquarium, it wouldn’t be as devastating as missing the zoo or the botanical garden! The Travel Channel recently called the Albuquerque BioPark’s Botanical Garden the fifth best in the country, and I highly recommend trying to fit it into your visit to the ABQ BioPark! Pack a picnic lunch to enjoy in the zoo’s Central Parq.